Every teacher is involved in the complex business of fostering high aspirations in our learners. Finding a practical way to do this through the learning that we design and how we deliver it can be incredibly challenging. It is true to say that to do so would constitute far more than a Marginal Learning Gain as if we are able to find a way to establish a highly aspirational culture in our lessons, then this has the potential to pervade whole-school culture. As always, striving for an aspirational culture, the Marginal Learning Gains can be found nestled deep inside what is meant by ‘aspiration’. What is really worth focusing on is ‘expectations’. It’s a mindset thing. The MLG here is characterised by the mindset of the teacher and how this is communicated through the design and delivery of learning experiences. It comes down to a (tiny) change in our language and, as a result, the language of our learners. “How ‘hopeful’ was Dave Brailsford on the morning of the first leg of The Tour De France or on the morning of the first cycling competitions in London 2012? Did he hope that Bradley Wiggins would win or did he expect it? Did he hope that Team GB Cycling would reach their targets on the medal tables or did he expect it? More to the point, did he and his team communicate an expectation of success to the riders, or simply pat them on the back as they cruised to the start line and then say that they hoped they would win? Often, when planning lessons together, teachers state that they hope that the students will get to the (x) task. When reflecting on lessons, teachers often say that they had hoped that the group would have achieved (x). How do we establish a culture of aspirational learning through the language of learning in which we think and speak? What practical strategies can I implement to establish a culture of aspirational learning? 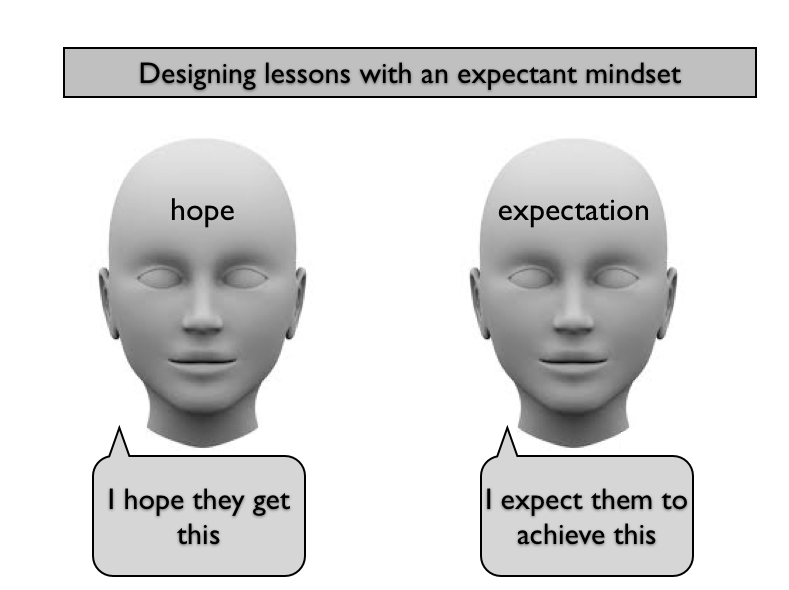 How can we deliberately develop learner aspirations through our own mindset and language? How will we know when it’s working? What language do I think in? The final question here is the one to hone in on as a first MLG opportunity. What do I hope students will be able to do as a result of this lesson? What do I expect students to be able to do as a result of the lesson? In this way, students are starting to really own their ambition. They select what goals they want to aim for (AUTONOMY) and take responsibility for and ownership of these goals (AGENCY). As a result of today’s lesson, I can…. As a result of today’s lesson, I will…. A highly aspirational learning culture will be characterised by the typical and frequent use of just this expectant language, shared by teachers and students alike. So we think it first, use it in our learning outcomes, lesson design and conversations with students. They, in turn, use the same language. They are specific in what they want to achieve, they set their own goals and they expect to achieve them. When they do achieve them, they are able to provide evidence for how this was done and If for some reason they do not achieve these goals, they are immediately prompted to ask why not and what steps they WILL take to meet their next goal. 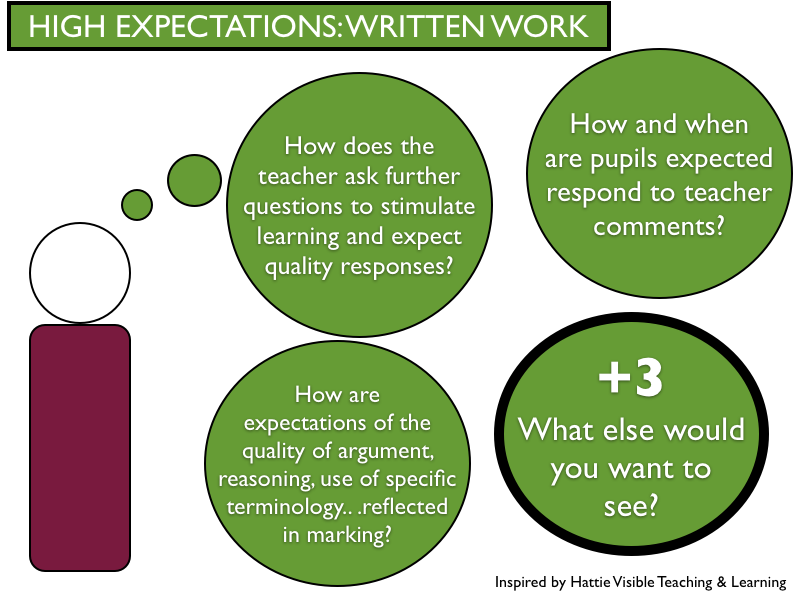 The language of expectancy starts to take on the following format: Structured, Specific and Succinct or S3 for short. First, I am going to ask you to look at an image on your own and think about it for 1 minute. Second, you will have 2 minutes to discuss your thinking with your partner and together, write down 3 possible responses to the image. Third and last, still with your partner, you will both have just 30 seconds to agree your BEST THINKING in response to this image. 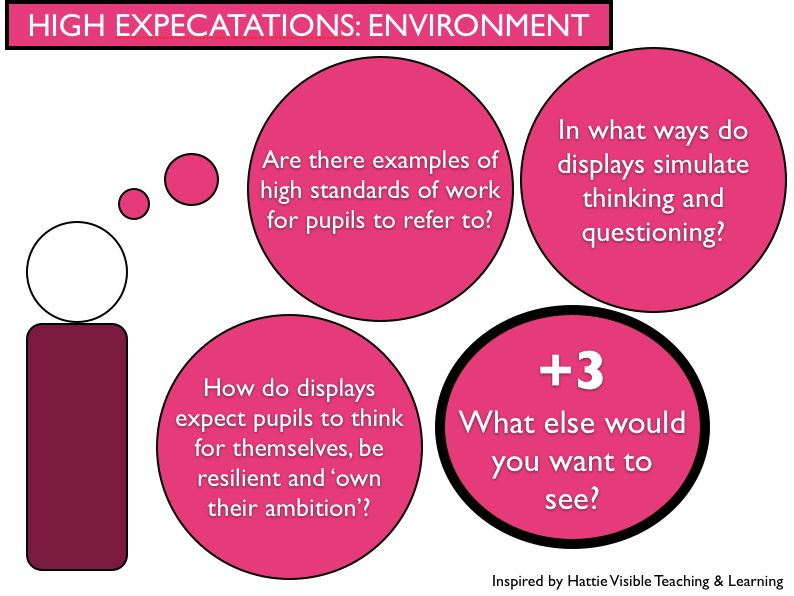 In being explicit about expectations, we can frame success criteria in a far more purposeful and succinct way. If we want a group to come up with some good questions about a topic, we can start to think about how many questions we realistically, or ambitiously, expect them to come up with. Then we can specifically tell them how many questions we really expect them to generate. If we think they will need about three minutes to do this, we can tell them we expect them to come up with (x number) of questions in (x amount) of time. In this way, we will can be clear about our expectations and communicate our belief in their ability to achieve this at the same time, SO THAT we nurture their personal sense of agency and a ‘can do’ attitude in learning. When we are expectant of ourselves and each other, surely then, we will find ourselves enjoying a culture of high aspirations? 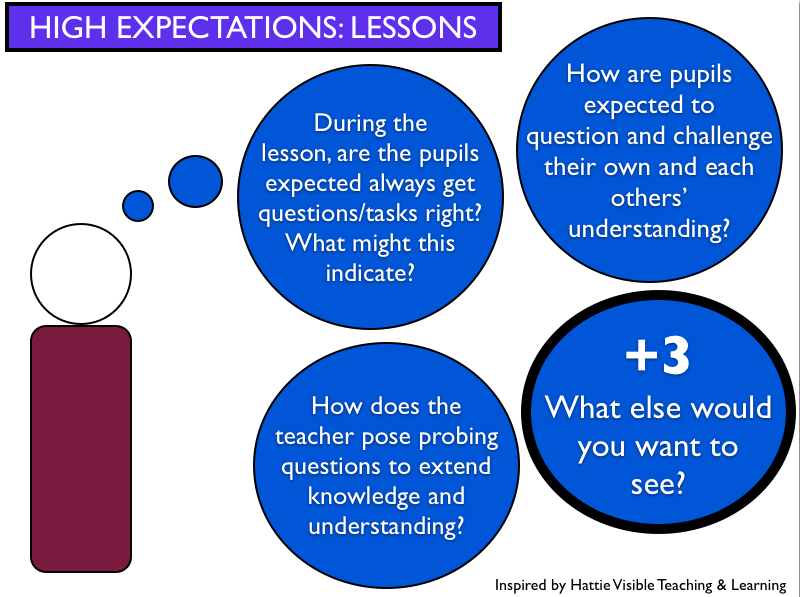 And if, for some reason, expectations are not met, then I wonder whether enables us to ask exclusively learning-focused questions as to why this hasn’t happened. In this way, we can avoid being left wondering whether a failure to meet a learning goal was because we did not explain the task with clarity, plan it well enough or think it through. We will surely know that, having adopted the ‘Expectant Teaching Mindset’, we certainly made it clear, we definitely planned it well and we meticulously thought it through, then the next obvious step is to respond to the missed goal as being down to a gap in knowledge, understanding or skill development. We can then immediately and confidently adjust our teaching accordingly. Reflecting on to what degree pupils are engaging in their own learning and what this looks like, rather than whether they just simply, ‘are or are not engaged’ is another important dimension of the mindset of expectant teaching that you may wish to develop. QUESTION: Who is at what level of engagement for a SPECIFIC phase of the lesson? (1) PARTICIPATING: Those who are simply ‘there’, being compliant to others and the lesson and completing tasks as and when they decide to, possibly prompted by eye contact with you or your proximity to them. (2) INVOLVED: Those who are following the path of least resistance, making you aware that they are there by answering the first and / or lowest challenge, ‘quick win’ questions but not taking their own thinking further or developing it beyond the initial stages. They don’t pose their own questions and certainly don’t take up the challenge of driving their own (or others’) learning on. (3) ENGAGED: BINGO! These are the students who question, consider, pose, test and really grapple with their own learning. They clarify their understanding through further questions to you and their peers and uses phrases like ‘I had a go at this…what do you think?’ These students demonstrate a real sense of AGENCY. What do you think is the difference between (a) PARTICIPATING (b) BEING INVOLVED (c) BEING ENGAGED? How ENGAGED (a) Do you EXPECT to be today (b) Did you EXPECT to be today? What does ‘being engaged’ look, sound and feel like for (a) you (b) your peers/ learning buddy? How do you need to change your EXPECTATIONS of yourself SO THAT you can move up the mountain of ENGAGEMENT? Please let me know how you get on with this MLG. Unpicking EXPECTATIONS is a critical component of the MLG project and one MLG that has massive potential when it comes to aggregating the MLGs. 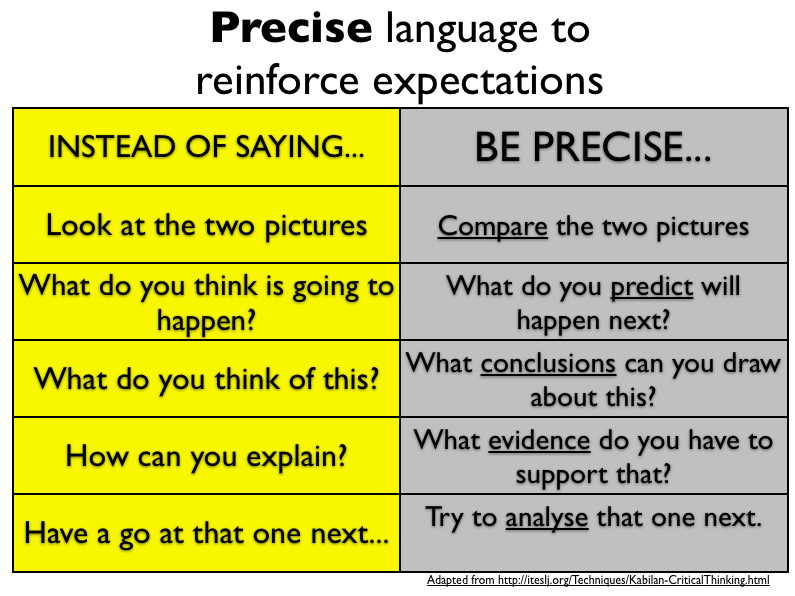 I have always believed and continue to write about language being key to creating a culture of high expectations and consequently, brilliant and positive behaviour in any learning environment. How refreshing to read this! Creating real autonomy/agency is so vital. A colleague approached me and asked what my ‘magic formula’ was for a particularly disruptive group she and other colleagues were unable to teach. This article is on its way to her. Thank you for taking the time to comment and I am really pleased that you have found this useful. It’s great to hear that you’re planning on passing it on to your colleague. Please let me know how it goes? Thank you again, Zoe. I found this a really exciting, inspirational post! I’m only at the early stages of a pgce but this makes so much sense! Going to try it out on my placement 🙂 Thanks so much. That’s great to hear. Thank you for taking the time to comment. 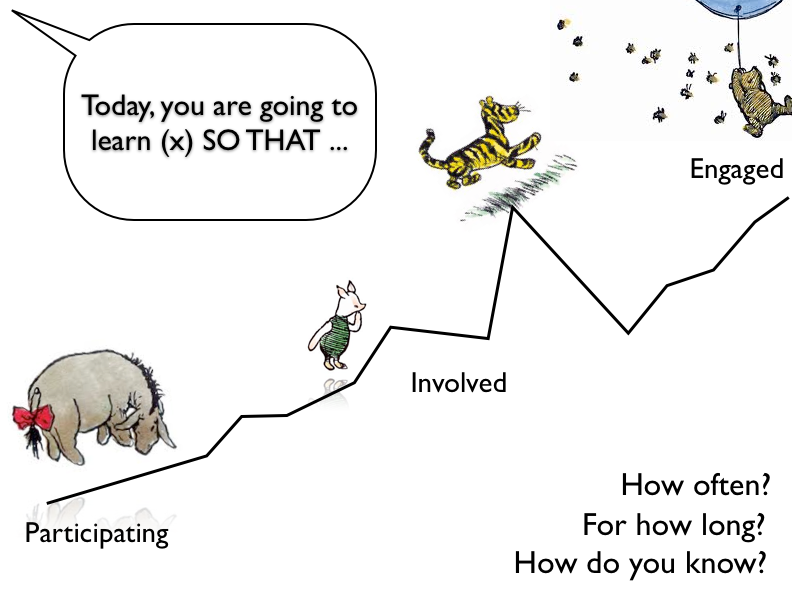 I am really pleased that you are finding the Marginal Learning Gains project inspirational. Please let me know how it goes on your placement? Thank you for this website – it is a great resource; relevant, well informed, engaging and up to the minute. It has a Secondary flavour but we (a Junior school) will be using it to support a whole school project around the marginal gains concept. Thank you for your feedback, John. I am really pleased that you are finding the site useful. Please keep me informed as to how your MLG work develops – having a cross-phase flavour to the work will add far greater depth.